Meriwhitica Canyon is a far away Colorado tributary in the middle of the Hualapai Reservation, and like the similarly exotic sounding Matkatamiba Canyon 70 miles to the northeast, was named after an Indian family who once lived in this area. It is an lengthy, branched drainage but most of its 13 miles are quite wide, relatively shallow and not too scenic, characterised by rather drab cliffs of Redwall limestone above a U-shaped valley. The interesting section is the last couple of miles, leading up to the junction with the deeper Spencer Canyon, as here the cliffs rise and become more colorful, part of a more traditional Grand Canyon landscape with a big expanse of ridges, ledges, pinnacles and ravines. The end of Meriwhitica Canyon is marked by a sheer drop of 600 feet over a fluted wall of travertine, deposited over the millennia by a series of springs a few hundred yards upcanyon. 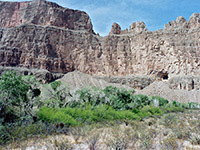 The waters emerge from limestone layers at the base of the cliffs on the south side of the valley and help sustain a large area of trees, bushes and reeds known as Indian Gardens, an odd sight in the otherwise dusty, reddish aridity of the surroundings. Nearby are some ruined stone buildings and ancient farming equipment, relics of one family's attempt to cultivate this area early last century. 8 views of Meriwhitica Canyon. 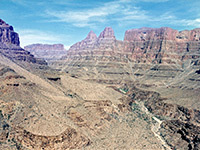 Panorama at the end of the canyon. Unusually for this very remote region, the canyon has a constructed trail starting from a viewpoint on the rim, though this seems almost completely disused and the location is not easy to reach, being 30 miles from a paved highway. Access is via the Buck and Doe Road starting from US 66 east of Peach Springs; this is paved for a short distance then has a good gravel surface for another 15 miles, to a little way past the turn off for Milkweed Spring after which it narrows and is more bumpy. 22 miles from US 66 and 3 miles after some powerlines cross the road for the third time, a side track signposted to North Tank branches right (north). This is Meriwhitica Road, the second turning on the right, after the powerlines. It crosses bushy, rocky land passing a few houses, corrals, and two cattleguards one with a wire gate, then descends with a couple of steep/rough spots to a flat, open plateau, ending with a long straight stretch to another old corral right at the canyon edge. There are countless lonely viewpoints in Arizona but this one has a particular feeling of isolation. 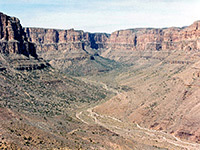 The road's end has a fine view over the rim and 1,600 feet below to the canyon floor. The trail down is wide but fenced off at the top and clearly disused - often the way ahead is partially blocked by fallen rocks and in some parts the surface has eroded away. There are no sign of footprints. The path descends on the right side of a ravine, turns back left then zig zags down a slope of big boulders past many cacti, yucca and assorted other thorny plants, where it is marked by a series of cairns, though the route is not always easy to follow and fades away as the slope lessens and the valley floor approaches. Walking becomes quite easy further down the main canyon, over level ground either along meandering, stony washes or mule trails. The springs are reached after another 4 miles and are enclosed by a swathe of trees and greenery stretching across all of the canyon floor. The ruined houses are found just before the woodland, as are scattered relics such as a plough, water troughs and other farming equipment; the springs are situated towards the south east edge of the Gardens but are well hidden by the dense undergrowth. The water runs down reed-lined streams for a while, forming several pools before seeping below ground, and is fine to drink without any purification. The spring area is best passed on the right side, after which a short walk leads to the big drop off above Spencer Canyon and a dramatic view of cliffs and buttes to the north. Most of the travertine rock is quite sheer though a trail winds down a slope on the right, then it is only 2 more miles to the Colorado. The river is not visible from the junction viewpoint but close enough to be clearly audible. A round trip to the drop off is 12 miles and takes about 5 hours.